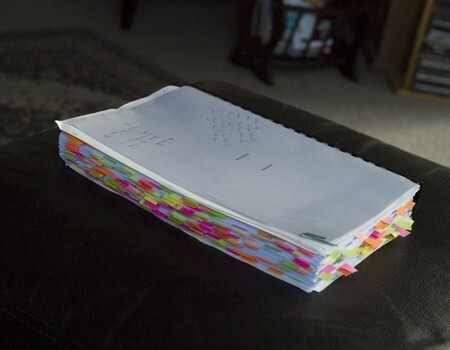 I began work on Innocence, the second book of Children, last week by annotating Immolation. I'd gotten it printed and bound out of Office Works, which always strikes me as a slightly lame thing to do, but binding is a hassle and they have all those big, industrious printers. The cost of it (forty bucks once it is printed and bound) is worth not having to do it myself, not to use up the ink at home, and not to have to print a document close to four hundred pages in length on a home printer. Most of the annotating is world building in terms of places, environment, history. Once the book is published, it will become the bible for the world and I won't be able to change it unless the change is part of the narrative, so I figure that it is pretty important to have everything organised and easy to access. Besides, it is just good to have all this information sorted. One of the most time consuming parts of writing Immolation was the world's creation. It was easy to come up with an idea (ideas are not very difficult in general) but to implement it, to ensure that it kept the style of the book, and indeed series, consistent, took more time. Often, it involved going back, rewriting a scene, changing an influence, altering a destination, creating an environment. Social structures and society play were a close second. Weaving that and the plot of the book together was, easily, fifty percent of the time I spent writing. I expect (and perhaps I will be wrong in this) that I will spend less time creating the world of Innocence because I have rules, guides, and work to play off already. There's a lot of new things to make, but once you have the ground rules of any world created, I've decided, everything after comes more naturally and easier--at least, that is how it has worked in the Red Sun stories, in the other books. Even in the Dead American stories, which aren't founded in worlds, but rather an ideology. I suspect the biggest challenge of Innocence will be working out how I want to structure it in terms of the series. Simultaneously it must build from the first and set up the third, yet maintain a strong sense of its own identity, and allow for it to be a complete reading experience. Which, y'know, sounds simple, right?